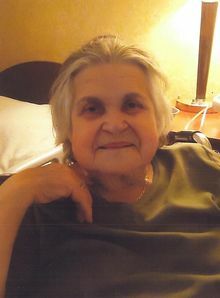 Eleni Broulidakis, 88, of Manchester, NH passed away after a long period of declining health on February 5, 2019. She was born December 22, 1930 in Pireas, Greece, daughter of the late George and Katarina Louvari. She enjoyed 53 years of marriage with her late husband, Emmanuel Broulidakis. Eleni was raised and educated near Athens, Greece. As a young child, she survived the German Occupation of Greece during World War II. In 1970, she and her husband moved their family to New Hampshire. Eleni found great comfort in her faith and was a devoted parishioner of the Dormition of the Theotokos Church in Concord. A devoted mother, grandmother and great grandmother, family was paramount in Eleni's life. She leaves behind her four sons, George and his wife Valarie, Andrew and his wife Stacy, Christos, and Jim and his wife Sonya; fourteen grandchildren, Alexander, Nicholas, Chris, Jennifer, Matthew, Talia, Sophia, Rosemary, Ray, Eleni, Fofi, Manny, Johnny and George; four great-grandchildren, Maximus, Avery, Elias and Stelios; as well as several nephews. In addition to her parents and husband, she was predeceased by her daughter-in-law, Rachel, and her brother and two sisters. Eleni's funeral service will take place on Thursday, February 7, 2019 at 11am at Dormition of the Theotokos Orthodox Church, 4 Union Street, Concord. She will be laid to rest at Pine Grove Cemetery, 765 Brown Ave, Manchester, following the service. In lieu of flowers, donations may be made in her memory to the Dormition of the Theotokos Orthodox Church. We will miss this sweet lady. May her memory be eternal. thoughts a prayers to the family. am so sorry for your loss, please accept my sincere condolences. May God bring everlasting comfort to your hearts and give you the strength to endure this difficult time.